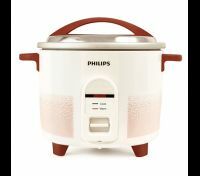 This philips rice cooker has an in-built, automatic keep warm function. The cooker automatically shifts to the keep warm mode & keeps cooked rice warm, moist & fresh for up to 4 hours. To Recieve updates and possible rewards for Philips HL1666/00 please sign in. To Recieve updates and possible rewards for Electric Rice Cooker please sign in.